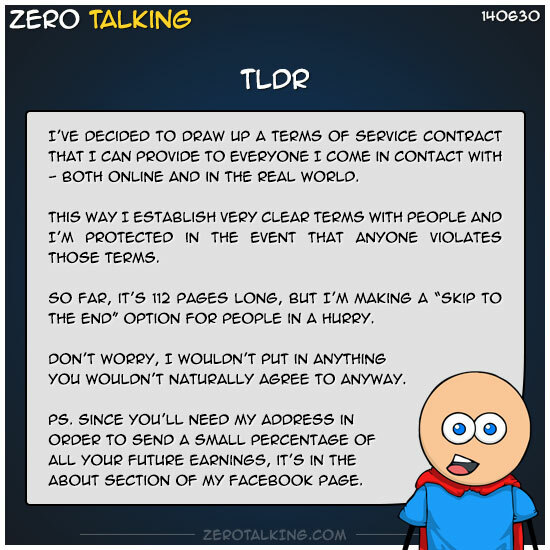 I’ve decided to draw up a Terms of Service contract that I can provide to everyone I come in contact with — both online and in the real world. This way I establish very clear terms with people and I’m protected in the event that anyone violates those terms. So far, it’s 112 pages long, but I’m making a “skip to the end” option for people in a hurry. Don’t worry, I wouldn’t put in anything you wouldn’t naturally agree to anyway. Since you’ll need my address in order to send a small percentage of all your future earnings, it’s in the about section of my facebook page.